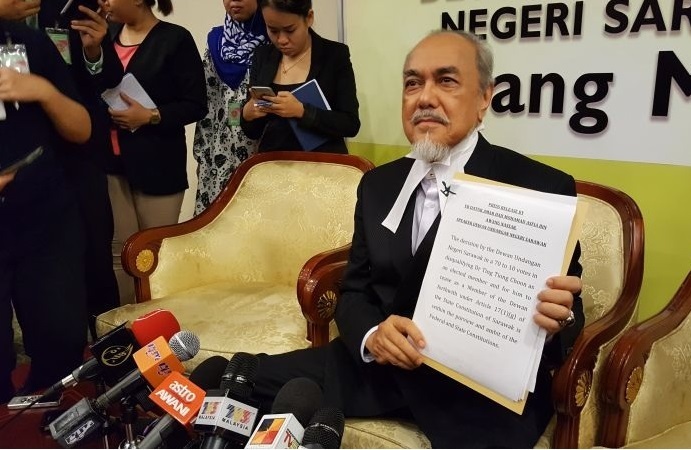 KUCHING: The Sarawak Consultative Committee on the Malaysia Agreement 1963 (MA63) holds that there are state rights, for instance on immigration, which it considers as non-negotiable, said its chairman Datuk Amar Mohamad Asfia Awang Nassar. Asfia, who is also Sarawak State Legislative Assembly Speaker, said the state’s territorial integrity-land mass, continental shelf, seabed and subsoil are also absolutely non-negotiable. “These issues and several more are not going to be raised during the steering committee meeting (on the MA63)…there is a red line there and even if they raise it in the steering committee we will say no,” Asfia told a press conference after chairing the first meeting of the Consultative Committee here Monday. Asfia said immigration is non-negotiable because to concede on immigration is to open the floodgates that would unleash a torrent of immigrants from across the border and those far outside Sarawak to sweep away the Sarawak population. The Consultative Committee meeting today discussed various issues pertaining to MA63 and will forward its recommendations to Sarawak Chief Minister Datuk Patinggi Abang Johari Tun Openg who will lead the state’s government delegation to the steering committee meeting (on the MA63) to be chaired by Prime Minister Tun Dr Mahathir Mohammed on Dec 17 in Kuala Lumpur. Both Abang Johari and the State Attorney-General Datuk Talat Mahmood Abdul Rashid sit in the steering committee. Asfia said Sarawak must make a strong stand speaking with one voice for Sarawak, adding that failing to do so, Sarawak may end up as voice of the voiceless. “In our approach we must be history-guided and driven, legally logical and constitutionally correct. We shall survey and scrutinise the parameters of MA63, fathom its ramifications and implications,” said Asfia. The committee was formed under Standing Order 89 of the Standing Orders of the Sarawak State Legislative Assembly and Article 24(1) of the Constitution of the State of Sarawak through a motion tabled in the assembly on Nov 6 this year. The committee has 13 other members who are representatives from Gabungan Parti Sarawak (GPS), DAP and PKR. Under the MA63, Sabah, Sarawak and Singapore joined the Federation of Malaya to form Malaysia in 1963 but Singapore exited the federation in 1965. Sabah and Sarawak are claiming that their status have eroded in the new federation (Malaysia) and are clamouring for more autonomy.